Who is Aphrodite? What is she? 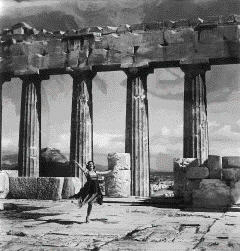 The fantasy of capturing the ancient world on film has fired the popular imagination ever since the early 19th century. Whether allowing armchair tourists the opportunity to view ancient sites without the need for travel, or reanimating ancient history and myth in flesh and blood, rather than pen and paint, the camera has, for more than two centuries, channelled a unique vision of the distant past. But while cinema’s relationship with antiquity has been endlessly studied in recent years, the same cannot be said of still photography, in all its forms. From the earliest days of the daguerreotype, which quickly became a valuable means of depicting archaeological sites, to the artistic photography of the present day, which can variously recreate and redestroy antiquity using both analogue and digital processes, the photographic medium is a powerful vehicle for exploring and commenting on our relationship to the past, which deserves to be examined in much more detail. This one-day colloquium aims to provide a forum for colleagues interested in this area of research, in which any question or topic related to the theme of Antiquity and Photography can be discussed. In particular, it is hoped that the colloquium will explore some of the more creative and/or subjective ways in which photography has addressed the ancient past, in addition to its use as a tool for documenting archaeological finds.